What is your anger pattern? I’m sure you have heard people say; “no, I’m not angry.” Do not believe them. One thing is for certain; as long as we are human we will experience some form of anger. 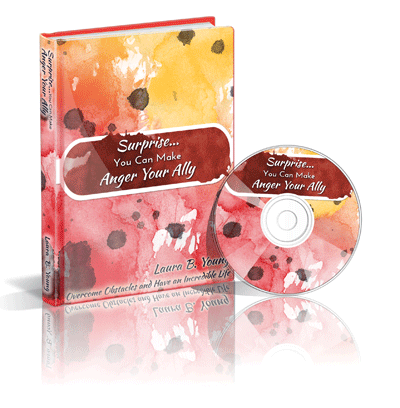 Being afraid of the volatile, vicious anger we see at one end of the spectrum, we tend to deny our angry feelings. Towards the other end of the scale we deny that our irritability, criticism, resentment, negativity, and being judgmental is anger Time to reflect, whatever pattern you use, your anger is powerful passion gone awry. To live more fully and creativity I show you how to transform this passionate energy; stop sabotaging relationships, and the quality of your lives. I had a bad temper, and exploded often, followed by periods of shame, and remorse. My verbal abuse cost me my marriage. I felt hopeless about anything ever changing until I came across Laura’s work “Make Anger Your Ally.” She didn’t condemn, but encouraged me to change. She gave steps and guidelines that showed me how to change the negative energy of anger, into something that works for, instead of against me. I learned that we use rage and anger as false power, until we develop our own personal power. Her work taught me how to do that and I have transformed my anger demon. Thank you Laura, without your help I would never have known the self respect that I have now.